RJ45 is a standard type of connector for network cables, which is usually used for data transmission. RJ45 connectors are most common applications for Ethernet cables and networks. The RJ45 connector is a modular plug used primarily for network cabling. The connector feature eight pins to which the wire strands of a cable interface electrically. Standard RJ-45 pinouts define the arrangement of the individual wires needed when attaching connectors to a cable. RJ45 is a type of a variety of different connectors (for example: a type of RJ11 is also a connector, but it is used in the phone). The line using of RJ45 connector has two types: straight-through and cross-over. 10/100 Base TX RJ45 interface is commonly used in Ethernet interface, support for network connection speed of 10Base and 100Base of adaptive common RJ45 connector into two categories: for Ethernet cards, routers and Ethernet interface DTE type, for switches DCE type. DTE can be called data terminal equipment; the DCE can be called data communications equipment. In one sense, the DTE device is called the "active communications equipment DCE device called a" passive communications equipment. When the two types of devices use RJ45 interface communication, you must use a crossover cable. This can be defined from the following types of pin definitions of the RJ45 the DTE and RJ45 DCE type pin. The RJ45 network cable connector also known as crystal head which a total of eight cores made ? ?of, widely used in LAN and ADSL broadband Internet connection to the user's cable network equipment which named as CAT cables or twisted-pair. 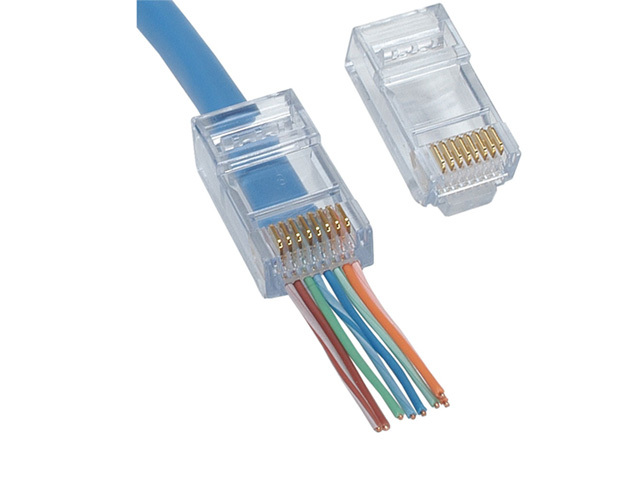 In the specific application, the RJ45-type plugs and cables, there are two connection methods, respectively called T568A line sequence and T568B linear order.